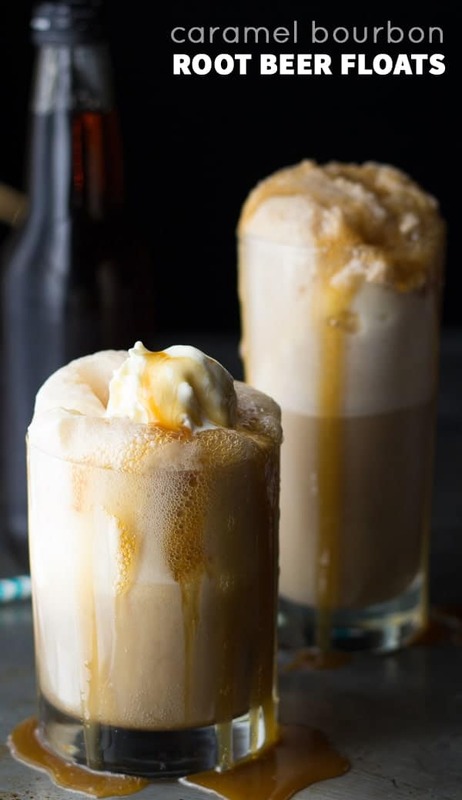 This bourbon root beer float recipe takes it to a whole new delicious level with a shot of bourbon and a drizzle of caramel! Weeeeellll. I’m a bit late with this bourbon root beer float recipe. I was going to post it yesterday, but got distracted, and then I was going to post it this morning, but got distracted. So here I am, posting this cocktail recipe on a Sunday afternoon. But that’s OK, because cocktails are tooootally in order on summery Sunday afternoons, right? We’ve actually had a pretty quiet week-end here, getting ready to really get back into the swing of things because tomorrow Kai is going back to day care and I will return to my dungeon office where I will continue plugging along on my thesis. It’s coming. Verrry slowly, but at least it’s doing something, right? OK…thesis and defence ramblings aside. How about bourbon root beer float ramblings? With ice cream, and bourbon, and caramel syrup. And they’re ridiculously easy to make and ridiculously easy to drink. And they’re going to make you ridiculously happy, because when you drink a root beer float, it just feels like summer. Because repeat after me: it’s still summer. No more of this pumpkin nonsense! 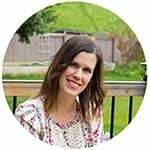 Head over to Real Housemoms, where I’m sharing my recipe! I just love root beer floats, and spiked ones are even better! Good luck on your thesis! I’m so excited for you! There is just something about root beer floats that make me feel like a kid again 🙂 Thanks, Thao! Denise, I need a root beer float – the weather here has been fiercely hot. The bourbon will help too! Great photos! Holy Hannah! These look ridiculous! Loving the float action, pretty sure I need this is a nightcap every night! This is definitely what I need right about now! I love a good boozy drink and this sounds absolutely perfect, Denise! You and me both! How is it only Tuesday? LOL. Thanks, Danielle! My husband is about a year away from writing his thesis! What are you getting your doctorate in?! How do you balance everything?! You must be wonder woman! Ha I am SO not wonder woman, but thanks, Beth! I am getting my degree in biochemistry (if all goes to plan)! Adding bourbon is such a good idea! HELLO ADULT ROOT BEER FLOATS =) My husband is obsessed with root beer floats, so this would be a hit at our house! Thanks Kait! Root beer floats make me feel like a kid again! Good luck with your thesis! This looks like an amazing treat for a hot day, it’s going to be 100 degrees here all week so I think I need to make some floats! Oh boy. This looks so tempting. PS- Something new with your header? It looks fab! Hi Michelle! Thanks! Yes, I had my whole site redesigned! I would be distracted with this treat in front of me, too 🙂 Love the flavors in this! Perfect for my super-hot Phoenix summer days & nights! Oh no you have a dungeon, too? My office has the tiniest window and my super smart husband built a shed in front of it. It’s SO DARK! Ha ha thanks, Sara! These look phenomenal! 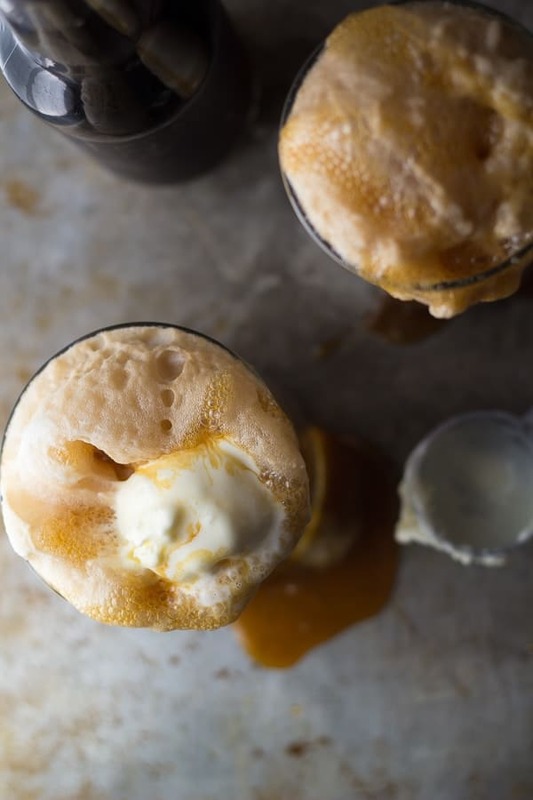 Caramel bourbon in a root beer float sounds outrageously good! These are so fun, Denise, and your photos are gorgeous! These would be my favorite root beer floats ever! Yes! I hope so, how about a Tuesday!? Boozy drinks are definitely needed any day of the week! These root beer floats look fantastic, Denise! Love the caramel and bourbon combo! Holy moly these look absolutely sensational! I would love one of these for breakfast, don’t tell anyone. You and me both, Jocelyn 😉 Thanks so much! These floats look and sound divine, Denise! Delicious – definitely the perfect treat for the weekend! 😀 Good luck with your thesis! There is so much to love about these boozy floats! These look incredibly awesome, Denise!! Wishing you good luck and success in your thesis writing! I say perfect timing for these floats! So many tasty things in them. Wishing you tons of productivity and progress with your thesis! Glad you agree, Ashley! Thanks!